A mobile exhibition project by Leipzig Academy of Visual Arts (HGB Leipzig – Prof. Alba D’Urbano, Carsten Möller) and Geneva University of Art and Design (HEAD Geneva – Prof. Ingrid Wildi Merino) with students from the intermedia class at HGB Leipzig and the master class at HEAD Geneva. 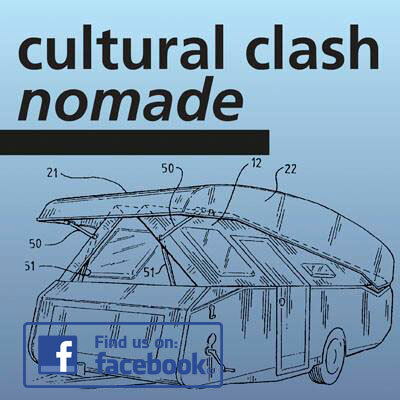 The mobile exhibition project Cultural Clash Nomad will get underway on 30 August. Taking the form of a caravan, over the course of two weeks it will move from Leipzig to Geneva via Nordhausen, Frankfurt, Ludwigshafen and Strasbourg. Under the artistic direction of Professor Alba D’Urbano and Professor Ingrid Wildi Merino, nineteen young artists will present their views on cultural identity, our understanding of which is currently in a state of flux. Reflecting the travelling nature of the exhibition, their art will be displayed in tents and caravans. 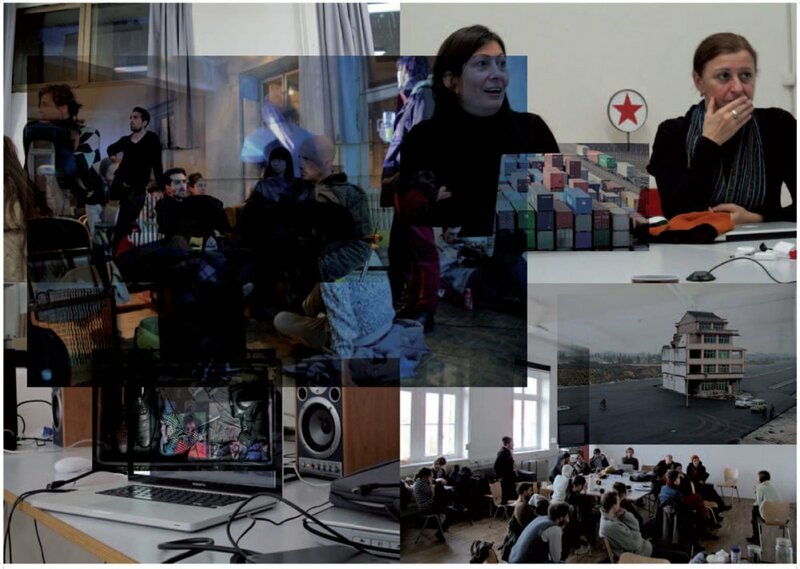 In addition, programmes tailored to and interacting with each location will be held comprising for instance screenings of videos and films, guided tours, readings, and finally in Geneva a display summing up the project. With the twenty-first century still in its early days, maximizing mobility appears to be its watchword. The form chosen for the exhibition alludes to migration, a seemingly all-embracing phenomenon. In fact nowadays everything is on the move, from goods and people to information and ideas. During the mobile exhibition project, artists/students from HGB Leipzig and HEAD Geneva will address the issue of cultural identity from historical, social, geopolitical and ethnic angles at each venue. How do these young artists establish where they belong in a Europe gripped by change? What potential does their different perception of the here and now harbour? Given the fact that the majority of these artists have an immigration background, what unites and separates them when they contemplate cultural identity if their roots are scattered among different countries and cultures? Art adapts to changing situations, and artists also have to be flexible in their outlook and limit themselves to the materials necessary to back up their artistic statements. Accordingly, the artists’ caravans and sleeping quarters will be located close to each venue, echoing the nomadic character of the exhibition. 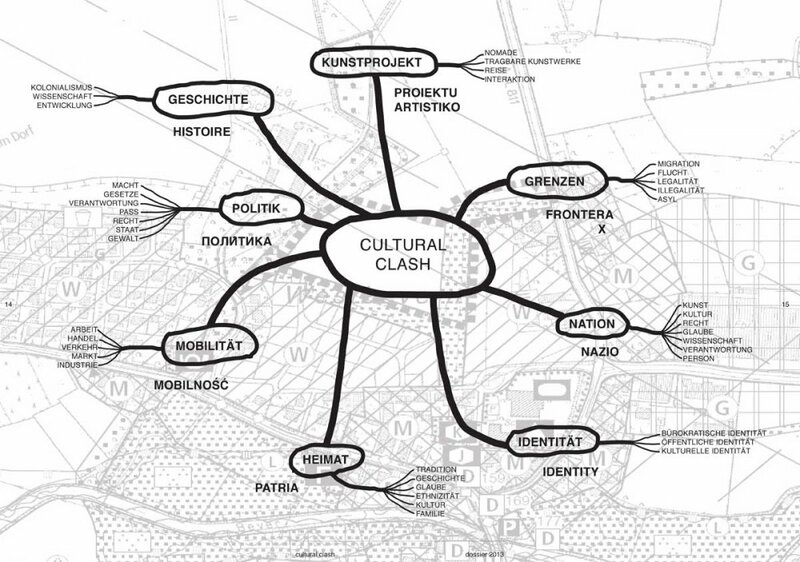 One key intention behind Cultural Clash Nomad is to encourage dialogue. At the six venues, the artistic stances presented in this travelling exhibition are to be compared to the approaches taken in their work by internationally renowned theorists and artists. The goal is to increase the exhibition project’s impact and to stimulate debate on the themes it tackles outside the exhibition, too. The programme on the opening night will include a screening of a video project by Stephanie Marek entitled ‘Kde domov muj/Where is my home’, in which the artist uses performance art to tackle the topic of rootlessness. The work shares its title with a melancholic song performed simultaneously which arouses associations with folksongs and lullabies. The evening will be brought to a close by DJ Chamigo Hukleson with a set based around the theme of national anthems. Apart from the regular exhibition, the next day a guided tour will be organized by the Postkolonial group dealing with colonialism in Leipzig, an almost forgotten period of German history. Being a city with a heritage of (overseas) trade stretching back centuries, traces of the German colonial era can also be found in Leipzig, including at the zoo, the university, in parks and on the old grounds of the Leipzig Fair. 5.9.-7.9. Frankfurt am Main. Ort: Offenes Haus der Kulturen, Universitätscampus Bockenheim.